Bank Corruption and Fraud,the Who ,the How and the Why and the Simple Solution! When looking at a crime scene we must think about ,motive and opportunity and who benefits?In this case IF we follow the money it always seems to lead back to the I.M.F. ,Goldman Sachs and Bailout buddies.So was it incompitance or conspiracy and is there a simple solution? Was There A Plan to Blow Up The U.S. Economy? Many people now believe that the financial crisis was not an accident. They think that the Bush administration and the Fed knew what Wall Street was up to and provided their support. This isn’t as far fetched as it sounds. As we will show, it’s clear that Bush, Greenspan and many other high-ranking officials understood the problem with subprime mortgages and knew that a huge asset bubble was emerging that threatened the economy. But while the housing bubble was more than just an innocent mistake, it doesn’t rise to the level of “conspiracy” which Webster defines as “a secret agreement between two or more people to perform an unlawful act.” It’s actually worse than that, because bubblemaking is the dominant policy, and it’s used to overcome the structural problems in capitalism itself, mainly stagnation. What Brenner describes is an economy that’s flat on its back; an economy that–despite unfunded tax cuts, massive military spending and gigantic asset bubbles–can barely produce positive growth. The pervasive lethargy of mature capitalist economies, poses huge challenges for industry bosses who are judged solely on their ability to boost quarterly profits. Goldman’s Lloyd Blankfein and JPM’s Jamie Dimon could care less about economic theory, what they’re interested in is making money; how to deploy their capital in a way that maximizes return on investment. “Profits”, that’s it. And that’s much more difficult in a world that’s saturated with overcapacity and flagging demand. The world doesn’t need more widgets or widget-makers. The only way to ensure profitability is to invent an alternate system altogether, a new universe of financial exotica (CDOs, MBSs, CDSs) that operates independent of the sluggish real economy. Financialization provides that opportunity. It allows the main players to pump-up the leverage, minimize capital-outlay, inflate asset prices, and skim off record profits even while the real economy endures severe stagnation. Financialization provides a path to wealth creation, which is why the sector’s portion of total corporate profits is now nearly 40 percent. It’s a way to bypass the pervasive inertia of the production-oriented economy. The Fed’s role in this new paradigm is to create a hospitable environment (low interest rates) for bubble-making so the upward transfer of wealth can continue without interruption. Bubblemaking is policy. FOR A LOT OF BANKERS GREED BLINDED THEM AND THEY BROKE THIER OWN GRAVY TRAIN ,NOT THE BRIGHTEST OR BEST THING TO DO. IN FACT ITS CRIMINAL NEGLIGENCE! SO ITS A CONSPIRACY ENABLED BY GREED ,CORRUPTION AND CRIMINAL NEGLIGENCE! But, while its true that Greenspan and the Wall Street mandarins knew how the bubble-game was played; they had no intention of blowing up the whole system. They simply wanted to inflate the bubble, make their profits, and get out before the inevitable crash. But, then something went wrong. When Lehman collapsed, the entire financial system suffered a major heart attack. All of the so-called “experts” models turned out to be wrong. And that’s exactly what happened. The market for structured debt crashed, stocks began to plummet, and the Fed had to step in to save the system. Unfortunately, that same deeply-flawed system is being rebuilt brick-by-brick without any substantive changes.. The Fed and Treasury support this effort, because–as agents of the banks–they are willing to sacrifice their own credibility to defend the primary profit-generating instruments of the industry leaders. (Goldman, JPM, etc) That means that Bernanke and Geithner will go to the mat to oppose any additional regulation on derivatives, securitization and off-balance sheet operations, the same lethal devices that triggered the financial crisis. SORRY FOLKS BUT I THINK THIS IS UNBELIEVABLE. WHAT IS HAPPENING TODAY HAS HAPPENED BEFORE . 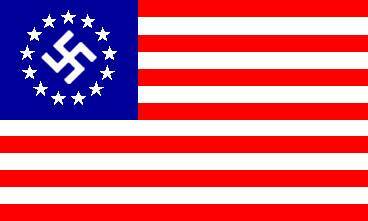 The USA goes bankrupt in 1933 and just survives a corporate Wall Street backed Nazi fascist coup. This lead to the rise of America as a manufacturing Super power ,briefly before stock market bubbles bring it down again…. Will Anyone At Goldman Sachs Go To Jail? Will Goldman survive the assault? Will the threat of criminal charges being pursued against the world’s leading investment bank spill over onto others on Wall Street? Is the criminalization of the crisis underway, or is all this just a maneuver? The bottom line: don’t get your hopes up. The government has not declared war on Wall Street even after Wall Street declared war on Main Street. And the media is complicit, even blacking out a march of 15,000 workers on Wall Street. SO NO ….DO NOT EXPECT TO SEE THE BIG PLAYERS IN JAIL.DID THE IRAN-CONTRA GUILTY GO TO JAIL OR THE BUSINESS PLOTTERS OF 1933?……NO! AT LEAST IN THE LAST GREAT DEPRESSION THE BANKERS FELT SOME REMORSE AND SOME EVEN HAD THE DECENCY TO JUMP OUT THE WINDOW….BUT THAT WAS YESTERDAYS BANKER ,TODAY’S BANKER IS DOING GOD’S WORK AND STILL EXPECTS A BONUS?!?! SO THESE GUYS WORSHIP A GOD THAT IS HEAVILY INVESTED IN THE FINANCIAL MARKETS?!?!?!?! THE LAST PERSON I KNOW THAT CLAIMED TO BE GOD’S BANKER WAS FOUND RITUALLY MURDERED AND HIS BODY LEFT HANGING UNDER BLACKFRIARS BRIDGE ……….. OR IS THIS JUST WISHFUL THINKING? Known as God’s banker for his links with the Vatican, 62-year-old Roberto Calvi was the chairman of Banco Ambrosiano in Milan and a central figure in a complex web of international fraud and intrigue. “We are Wall Street. It’s our job to make money. Whether it’s a commodity, stock, bond, or some hypothetical piece of fake paper, it doesn’t matter. We would trade baseball cards if it were profitable… Go ahead and continue to take us down, but you’re only going to hurt yourselves. What’s going to happen when we can’t find jobs on the Street anymore? Guess what: We’re going to take yours. MEANWHILE IN REALITY MR BANKER, IF THE RULES OF CAPITALISM WHERE APPLIED YOU WOULD BE UNEMPLOYED! ACTUALLY TODAY YOUR ARE GETTING A STATE DOLE CHECK , AS THE BANK IS A STATE RUN ASSET ,YOU ARE A PUBLIC SERVANT AND YOUR MONEY COMES FROM THE TAXPAYER. THE RBS(Royal Bank of Scotland) LOST 3 BILLIONS POUNDS BUT YOU BANKERS EXPECT A 1.3BILLION BONUS!!!!! PLEASE WHERE DO YOU FIND +1.3 BILLION FROM – 3 BILLION? FYI IN CAPITALISM IT HELPS IF YOU HAVE CAPITAL AND TO PAY A BONUS YOU NEED TO MAKE MONEY!!! NO WONDER THE BANKING INDUSTRY IS IN THE STATE IT IS WITH FINANCIAL MUPPETS LIKE THESE!!!! YOU GUYS HAVE LOST SO MUCH MONEY THE FIGURES WOULD MAKE AN ASTRO-PHYSICISTS HEAD SPIN!! News Dissector Danny Schechters film and book will be released in April by Disinformation. For more information, Http://www.plunderhecrimeofourtime.com. THE STATE CAPITALIST EXPERIMENT HAS FAILED (OR SUCCEEDED) BEYOND BELIEF .THE REAL FINANCIAL CRISIS IS STILL IN THE WINGS .THE 605 TRILLION DOLLAR DERIVITIVES MARKET. THIS IS WHAT WILL BRING DOWN NATIONS…..OR THE BANKS ,IT IS YOUR CHOICE!!! AND THE DERIVITIVES MARKETS STILL NEED A BAILOUT!!! A “derivative” market is one that is “derived” from an underlying asset, but participants don’t have to own the asset to play. Like gamblers at a race track, they can bet without owning a horse. Derivatives have now become a $605 trillion industry, about ten times the gross domestic product of all the countries of the world combined. This money is not contributing capital to businesses, helping the economy to grow. Rather, it is being diverted into wagers. Money is made by taking it from someone else. Worse, half the wagers are negative: the players want the thing to fail. Warren Buffet called derivatives “financial weapons of mass destruction.” By massively short selling a stock or a currency, speculators can actually force the price down. Derivatives can be used to sabotage not only businesses but whole economies. Derivatives have been blamed for such economic disasters as the collapse of Japan’s stock market in 1987, the Asian crisis of 1998, and the recent collapse of Greece. STOCK MARKET MANIPULATION IS ALSO WIDESPREAD .THIS IS ALSO FRAUD AND SHOWS CONTROL FROM BEHIND THE SCENES…ALSO THE FED LIED ABOUT THE BAILOUT ,THAT’S WHY THEY WON’T LET THE TAXPAYER SEE WHO GOT WHAT!!! If your trades are slower than 50ms youre a dinosaur. While the SEC is busy investigating Goldman Sachs, it might want to look into another Goldman-dominated fraud: computerized front running using high-frequency trading programs. Market commentators are fond of talking about “free market capitalism,” but according to Wall Street commentator Max Keiser, it is no more. It has morphed into what his TV co-host Stacy Herbert calls “rigged market capitalism”: all markets today are subject to manipulation for private gain. SO WHY THE BAILOUT INSTEAD OF A DEFAULT? So who are they protecting, the answer is simple; the bond holders. Roughly, 80% of this debt is foreign owned and a large portion of this is held by German and French Citizens. Bottom line this rescue package is not for Greece, but it’s a rescue for Greek bond holders worldwide. If Greece were to default tomorrow, it would not disappear, but its debt holders would be seriously hurt. Thus behind all this noise one must understand that the main reason for the bailout is to protect the bondholders; the exact same story unfolded in the US, the only difference being that it was a bailout of the banking industry. As the Germans and French hold a very large percentage of these bonds, it is actually a bailout of Germany and France and not really Greece. They should let Greece’s default but they will not. A DEFAULT ONLY EFFECTS THE PRIVATE INVESTORS ,NOT THE POPULATION. SO WHY WE ARE PROTECTING THE BOND HOLDERS AND GOLDMAN SACHS AGAIN. Greek Bondholders “Fooled” or Goldman Sachs Committing Fraud? Today, she questions why Bloomberg prefers to only discuss the Goldman Sachs-Greece cross currency swaps subterfuge as a sort of foolishness, rather than taking a much more serious tone. Smith takes Bloomberg to task for using “fooled” when “more obvious F-words, like ‘Fraud’ (as in defrauded) or ‘fleeced’” should have been considered. Then, she digs into her banking experience to relate how to her it seems nearly impossible that Goldman wouldn’t know the nature and extent of the Greek swaps contracts when the bond offering was issued. SO IS IT GREEK GOVERNMENT CORRUPTION THAT IS CAUSING THE SELLOUT OF THE GREEK PEOPLE? OR IS THE GREEK GOVERNMENT BEING THREATENED OR BLACKMAILED OR BRIBED? POLAND’S GOVERNMENT SAID NO TO THE IMF AND THE EURO AND GOLDMAN SACHS ,…..THEY ARE DEAD NOW….COINCIDENCE? Did The Global Elite Assassinate Poland President Lech Kaczynski? “help other countries overcome the effects of the global crisis,” the AFP reported on March 29, 2010. Poland was the only member of the 27-nation European Union to have experienced growth in 2009 and the IMF forecast that its economy would expand by 2.75 percent this year and by 3.25 percent in 2011. Poland’s zloty grew by 1.7 percent in 2009, a remarkable feat given that European Union countries contracted by an average of 4.1 percent and no other EU economy grew at all. “Poland avoided eastern Europe’s worst lending binges. Kaczynski frustrated some of his opponents by being in no rush to head towards the euro party,” the Daily Telegraph reports today. Earlier this month, Czech Central Bank Vice Deputy Mojmir Hampl said the IMF fueled Eastern Europe’s crisis to create a situation that would compel regional states to request the help from the globalist loan sharking operation. “He said that the institution, which offered emergency funds for Hungary,Lithuania, Ukraine and Romania, misinterpreted some data because they are looking for new clients as the leadership changed,” HotNews reported. In addition, Kaczynski placed a euro-skeptic ally in charge of the central bank, Slawomir Skrzypek, who was also killed in the crash. It looks like Poland may soon join the EU Borg hive with open arms. CFR, Trilateral Commission Member to Replace Poland’s Kaczynski? BusinessWeek reported yesterday that Andrzej Olechowski will enter a presidential race in Poland to replace Lech Kaczynski. “The Polish Peasants’ Party, the junior partner in the governing coalition, will probably nominate its leader, Economy Minister Waldemar Pawlak, and Andrzej Olechowski, a former foreign minister and finance minister, will run as an independent,” it is reported. Odds on Andrzej Olechowski. He is a member of the Council on Foreign Relations and the Trilateral Commission. He was also an economist for the World Bank. He also appears to work closely with the banksters: Olechowski sat on the supervisory boards of a number of European banks and corporations. Most notably he was on the advisory board of Goldman Sachs (see this biography on Olechowski’s personal home page; in Polish). I am not saying Lech Kaczynski was killed in order for a one-worlder to take his place. I am saying that it is an opportunity for another bankster minion to rule a country that seemed to be at odds with the European Union and the one-world project. FYI IF POLAND WAS A DIRECT DEMOCRACY , THIS “PLANE CRASH” WOULD NOT EFFECT THE EXECUTIVE ,AS THE EXECUTIVE ARE THE PEOPLE!!! IN ICELAND GOLDMAN SACHS AND THE UK AND DUTCH TRIED TO MAKE THE ICELANDIC TAXPAYER PICK UP THE 40 BILLION EURO DEBT!! BY BRIBES AND THREATS TO THE ICELANDIC GOVERNMENT!! THE ICELANDIC GOVERNMENT (ELECTED DICTATORSHIP) WHERE MORE THAN HAPPY TO SELL THIER CITIZENS INTO DEBT SLAVERY.LUCKILY REAL DIRECT DEMOCRACY LIVES IN ICELAND AND THE PEOPLE SAID NO!!! No matter what reasonable and respected voices had to say on the matter. The government opposed the idea of a direct democratic decision. SO THE “SECURITY” SERVICES NOW GO AFTER THE FREE PEOPLE!!! WELCOME TO THE NEW WORLD ORDER POLICE STATE !! Developing world violence aside, we’ve become used to the level of security service interest in us and have established procedures to ignore that interest.But the increase in surveillance activities this last month, in a time when we are barely publishing due to fundraising, are excessive. The spying includes attempted covert following, photographng, filming and the overt detention & questioning of a WikiLeaks’ volunteer in Iceland on Monday night. I, and others were in Iceland to advise Icelandic parliamentarians on the Icelandic Modern Media Initiative, a new package of laws designed to protect investigative journalists and internet services from spying and censorship. As such, the spying has an extra poignancy. SO MUCH FOR A FREE PRESS AND FREEDOM OF SPEACH IN A REPRESENTATIVE DEMOCRACY !!! BUT THIS “SECURITY” SERVICE RESPONSE IS INEFFECTIVE AND IT WILL NOT WORK AGAINST TRUE FREEDOM LOVING PEOPLE!! BUT do YOU still feel clever and classless and free? IN THE UK ,USA AND EU WE HAVE AN ELECTED DICTATORSHIP SO NO VOTE FOR THE COMMON MAN , YOU WILL BE SOLD INTO DEBT SLAVERY BY CORRUPT ,BRIBED AND BLACKMAILED GOVERNMENT REPRESENTATIVES!!! (CNN) — Europe’s finance ministers approved in an emergency meeting late Sunday a “stabilization mechanism” that could provide at least 440 billion euros (US $560 billion) for a crisis aid package aimed at ensuring financial stability across Europe. The deal comes after a week of heavy stock market losses for some of the European Union’s member states in the wake of a massive bailout for Greece’s battered economy. ROMANIA’S GOVERNMENT (REPRESENTATIVE DEMOCRACY) SELL THE POPULATION INTO DEBT SLAVERY ,SO PRIVATE BOND HOLDERS CAN KEEP THE LIFESTYLE THEY ARE ACCUSTOMMED TOO. Romania is to cut wages and pensions in the public sector later this year to comply with an IMF-led rescue deal. THE EUROPEAN TAXPAYER IS NOT RESPONSIBLE FOR THE DEBT OF A CORRUPT AND FRAUDULENT PRIVATE INVESTMENT BANK AND THIER PRIVATE BOND HOLDERS AND THIER BRIBED AND BLACKMAILED POLITICAL REPRESENTATIVES!!!!!! SO GOLDMAN SACHS AND BAILOUT BUDDIES ,YOU ARE IRRESPONSIBLE AND UNPROFITABLE AND YOU GET LIQUIDATED AND YOUR ASSETS GO ON SALE. THE TAXPAYER IS NOT LEGALLY OR MORALLY RESPONSIBLE FOR PAYING THIS DEBT!!!! IF THE DEBT IS FRAUD THEN DECLARE IT ILLEGAL AND PUT GOLDMAN SACHS IN COURT AGAIN!!!!! DEFAULT TODAY ,LET THE BANK DIE ,NOT THE PEOPLE BE ENSLAVED. The bankers made this debt like hopless and crooked casino gamblers ,so it was thier risk and thier profit or loss. NOT THE TAXPYERS !! AND you should NOT gamble what you cannot afford to loose ,if you have, I suggest this is neither the brightest or best thing to have done! It is NOT responsible nor in the end profitable either BUT Bankers seem to be rich and own thier own homes so unemployment should not be a hardship and they seem MORE LIKELY to be able to PAY the debt THEY CREATED with the liquidation of thier assets. We keep bankers and politions in the lifestyle they have become accustomed too, and sell ourselves and our children into debt slavery. SO TODAY’S WHO ,HOW, AND WHY ARE STILL THE SAME PEOPLE ,USING THE SAME TOOLS AND FOR THE SAME REASONS. THEY DO NOT SOUND LIKE THE BRIGHTEST AND BEST TO ME……..
HOW – Economic Arson ,Media Lies and War. IN REALITY THIS IS PURELY A BANKER PLANNED PROBLEM, NOT A TAXPAYERS OR GOVERNMENTS PROBLEM. IT HAS BEEN MANUFACTURED BY CONSPIRACY AND INCOMPITENCE AND FUELLED BY NAKED GREED AND POLITICAL CORRUPTION!!! THE MONEY NEVER EXISTED IN THE FIRST PLACE ,THE BANK PRINTED IT OUT OF THIN AIR. OUR GOVERNMENTS ARE JUST TRYING TO SELL US ALL INTO DEBT SLAVERY FOR LIFE!!! ITS YOUR CHOICE ,FREEDOM IS, AS FREEDOM DOES AND WE HAVE BEATEN THEM BEFORE ,WE CAN BEAT THEM AGAIN. THEY ARE PAPER TIGERS ,IF THEY WHERE REAL TIGERS WE WOULD ALL OF BEEN ENSLAVED LONG AGO. ITS TIME TO MAKE THEM REALISE THEY HAVE AWOKEN A SLEEPING GIANT!!! YOU ARE FREE UNTIL SOMEONE PHYSICALLY TRIES TO STOP YOU FROM BEING FREE , THE GOVERNMENT IS SUPPOSED TO BE YOUR PUBLIC SERVANT ,YOU ARE THE TAXPAY MASTER. START BEHAVING LIKE IT!!! ITS TIME TO GIVE THE PUBLIC SERVANTS A GOOD HORSE WHIPPING AND DRIVE THEM OUT OF YOUR HOME , AS THEY HAVE BEEN STEALING THE FAMILY SILVER AND MAKING US SLEEP IN THE SERVANTS QUATERS ,WHILE WE PAY FOR THIER LAVISH LIFESTYLE ? …AND NOW THEY WANT TO SELL OUR CHILDREN INTO SLAVERY TO PAY FOR THIER DEBTS!!! A DIRECT DEMOCRACY WOULD END THE FINANCIAL AND BANKING CRISIS STONE DEAD!!!!!! WE CAN ALL BE DEBT FREE TOMORROW!!! ARE YOU NOT ANGRY YET? SHUTDOWN THE FRAUDULENT AND CORRUPT BANKS TODAY ,AUDIT THEM AND SIEZE THIER ASSETS!!!!! IN THE USA AN ENVIRONMENTAL DISASTER IS TAKING PLACE . THERE IS A CALL TO SIEZE BP’S ASSETS UNTIL THE MESS IS CLEARED UP AND PAID FOR!!! THE REVOLUTION WILL NOT BE TELEVISED BUT ARGENTINA , ICELAND ,THIALAND AND GREECE ARE SHOWING US THE WAY……….. IF YOU TOLERATE THIS ,THEN YOUR CHILDREN WILL BE NEXT!! QUESTION EVERYTHING ,TRUTH CAN HANDLE AWKWARD QUESTIONS! AND THE TRUTH WILL SET YOU FREE!! Its Official the Economy will Recover…..When PIGS Fly! CRY HAVOC AND UNLEASH THE PIGS OF FINANCE …….but which Pigs are we taking about? PIIGS and PIGS are acronyms used by international bond analysts, academics, and by the international economic press that refer to the economies of Portugal, Italy, Ireland, Greece, and Spain, especially in regards to matters relating to sovereign debt markets. When rendered as “PIGS”, the “I” originally refered to Italy, but has occasionally become an interchangeable reference to Ireland. Some news and economic organisations have limited or banned their use due to criticism regarding perceived offensive connotations. ………ITALY (NO longer a PIG) used to be leftwing and is now right of centre ….could just be coincidence that all these countries that the bankers are after ,seem left of centre, most where right of centre when the banking crisis was forming. SECULAR SOCIALISTS NOT what Western Capitalists like at all!!! The “Brightest and the best” assure us that if Greece just follows thier orders ,all will be well. REMEMBER these people are the very people that got us into this mess!!!! They assure the public that Greece’s politicians are willing to impose spending cuts and tax increases that will push the ratio of the deficit to the Gross Domestic Product from 12.7% in 2009 to 8.7% this year and 3% in 2012. This is the promise of Greece’s Prime Minister, George Papandreau. He is the leader of the Panhellenic Socialist Movement. He has been the President of the Socialist International since 2006. He was born in Minnesota. He has a masters degree in sociology. Trust him! Here is a country that cannot balance its budget. It refuses to cut wages of its union-protected government employees. Its public sector workers rioted last week to protest the minimal austerity measures announced by the government. Yet, we are assured by a commissioner of the Economic and Monetary Affairs Commission, that “We expect that in due course the Greek government will take the necessary additional measures.” In due course. One of these days. Real Soon Now. Austrian Finance Minister Josef Proell said the region had to “act in the interest” of the euro currency and it was up to Greece to cut its deficit before the EU offers help. “Nobody can spare Greece the task of cleaning up its own house, Proell said in Brussels. “Only then will we decide whether financial signals have to be sent,” he said. Germany’s Wolfgang Schaeuble also said additional measures that Greece should take will be considered. Wait a minute! It will take months for the Greek government to produce fiscal results. In the meantime, how will Greece’s government borrow more money to stay afloat? How much will it pay to borrow? How will the crisis be deferred while the Eurocrats are waiting to see the official figures – from a government that has misled the banks from the beginning? 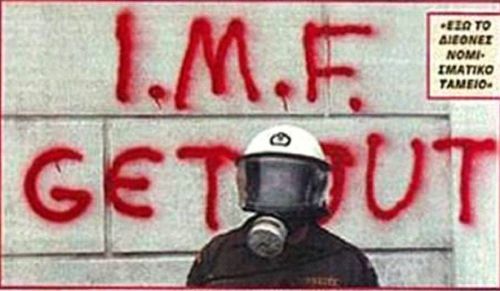 The GREEK GOVERNMENT is there to represent the Greek People NOT BLOOMBERG THE FINANCIAL MARKETS THE EURO OR THE EU!!!!! BUT POLITIONS ARE JUST AS CORRUPT AS BANKERS …THE GREEK PEOPLE understand this..
Feb. 24 (Bloomberg) — Greek police fired tear-gas and clashed with demonstrators in central Athens after a march organized by unions to oppose Prime Minister George Papandreou’s drive to cut the European Union’s biggest budget deficit. Please look at what Iceland is doing ,or Argentina for inspiration. OR ECUADOR ,THEY DECLARED THE DEBT ILLEGAL!! In September 2008 Ecuador became the first country in the world to declare constitutional rights to nature, thus codifying a new system of environmental protection. THESE FINANCIAL GENIUSES THAT DEMAND GREECE ETC DO THIER BIDDING ARE CROOKS AND THIER CURE WILL KILL YOU!!! IF ONLY THESE PIGS HAD FLOWN INTO ACTION INSTEAD, WE MIGHT NOT BE IN THE MESS WE ARE TODAY!! The Flying Squad is a branch of the Specialist Crime Directorate, within London’s Metropolitan Police Service.The Squad’s purpose is to investigate commercial armed robberies, along with the prevention and investigation of other serious armed crime. A LESSON FOR THE BRIGHTEST AND THE BEST. CAPITALISM EXPLAINED its not that difficul;t , so you see we do not need the brightest and the best. AT THE MOMMENT THE BRIGHTEST AND THE BEST GET MONEY FOR LESS THAN 1% INTEREST(BANK LENDING RATES) AND LEND IT FOR AT LEAST 5% INTEREST(PUBLIC BORROWING RATES). A MONKEY WITH LEARNING DIFFICULTIES COULD MAKE MONEY IN THIS SETUP!!!!!!!!!! BUT EVEN WITH THIS SETUP ,THESE FINANCIAL MUPPETS HAVE LOST BILLIONS , BUT STILL DEMAND BONUES!!!! Loss-making Royal Bank of Scotland is braced for a row over City pay next week when it is expected to admit that its bonus pot for 22,000 investment bankers has reached £1.3bn – against last year’s £1bn. The Edinburgh-based bank is awaiting approval from UK Financial Investments, the body that looks after the taxpayer’s 84% stake in the bank, for its proposed bonus pool. These “brightest and best” free market capitalists expect the taxpayer to pay the 4 BILLION in LOSSES AND 1.3 BILLION in BONUSES!! FYI RBS EMPLOYEES ARE GOVERNMENT EMPLOYEES WHILE THE TAXPAYER HOLDS 84% OF THESE DEVALUED SHARES. IF YOU UNDERSTAND FREE MARKET CAPITALISM YOU WOULD REALISE THAT YOUR BANK SHOULD OF GONE BUST AND YOU SHOULD BE UNEMPLOYED. THUS NO WAGES NEVERMIND A BONUS!!! AND AS RBS LOST NEARLY 4 BILLIONS POUNDS WHERE EXACTLY DO YOU EXPECT TO GET THE MONEY TO PAY THIS BONUS? SORRY THE MARKET HAS SPOKEN AND YOU ARE UNPROFITABLE AND IRRESPONSIBLE BY YOUR OWN STANDARDS, SO STOP BLUBBING!!! ACTUALLY THE FRAUD SQUAD SHOULD OF BEEN CALLED IN AGES AGO, FRAUD ,CORRUPTION , MARKET MANIPULATION ETC .ETC. THE BRIGHEST AND THE BEST OR A BUNCH OF GREEDY CRIMINAL FRAUDSTERS THAT ARE ALREADY BUST? OF COURSE THE FED DOES NOT WANT AUDITED, ITS BUST ,ITS CORRUPT AND ITS FAILED IN ITS DUTY!!!!!!! Bradford and Bingley’s slow 12 month death march towards the same fate as Northern Rock finally looks set to have come to an end with expectations on Sunday that the beleaguered bank will be nationalised with a view to a break of the bank and liquidation of assets so as to cover in part the estimated £20 billion bailout cost that is required to fill the gap between assets and liabilities. The toxic mortgages will probably end up with the government owned Northern Rock bank which will increasingly be seen as the UK Governments Toxic Mortgage Dump where the tulip backed securities of further bank busts and partial bailouts will end up. Now many banks are left with assets that are worth LESS than 50% of their “mark to market” booked value. Now that does not mean a 50% loss for the banks on investments, remember the greedy banks deployed LEVERAGE of as much as 30 times of assets, so capital of say £100 million is controlling risk of as much as £3,000 million. Therefore a 50% loss results in a loss of value of £1,500 million, that’s 15 TIMES the capital. Hence the banks have been reluctant to price their debt packages at the real market price as that would mean that the bank is effectively bankrupt with losses far greater than the banks capital base. So the market remains frozen until all of the illiquid mortgage backed debt has been transferred over to the tax payers in exchange for liquid cash, hence prompting the US Mother of All bailouts plan. AND THE DERIVITIVES MARKETS TO BAILOUT!!! AND AFTER TRILLIONS OF DOLLARS IN BANKER BAILOUTS THERE IS NOTHING LEFT IN THE KITTY FOR THE AVERAGE JOE! “Effective April 1, 2010, we reserve the right to require (7) days advance notice before permitting a withdrawal from all checking accounts. While we do not currently exercise this right and have not exercised it in the past, we are required by law to notify you of this change,” Citigroup said on statements received by customers all over the country. The Federal Deposit Insurance Corp. said Tuesday that its deposit-insurance fund fell to $20.9 billion at the end of 2009, a $12.6 billion drop in the final three months of the year, as bank failures continued at a pace not seen since the savings and loan crisis. The fund’s reserve ratio was -0.39% at the end of the quarter, the lowest on record for the combined bank and thrift fund. BUT WE HAVE GOT OURSELVES OUT OF THIS MESS BEFORE….HOW? Andrew Jackson was the last of three sons of Scotch-Irish immigrants. Andrew Jackson was the only President to pay off the national debt. He was the first President to be born in a log cabin, and the first to ride a train. Make the banks pay back ALL taxpayer money ,with the interest. Those that fall ,we asset strip and put thier assets on sale. We start criminal enquires into the causes of the bank failures and bailouts. Any banker OR polition found guilty should be stripped of all thier assets unless they can prove they bought them with money NOT related to bank fraud or corruption!! NEOCONS THE ANTI-HIPPIES…….. ALL THEY ARE SAYING IS GIVE WAR A CHANCE! If we are to learn anything from history,it should be that when economic crisis hits, for politions war is a good distraction and an economic manufacturing generator. As Andrew Jackson realised that War was a massive cash generator for bankers,that was why he kicked out this nest of vipers. We must realise that World Wars and wars around the world are big business for banks and those with stock portfolios, like politions. SO THE CIA AND THE UK DEFENDED OIL INTERESTS. OVERTHREW A DEMOCRATIC SECULAR SOCIALIST GOVERNMENT AND REPLACED THIS WITH A RIGHT WING AUTHORITARIAN REGIME!!!! THIS ULTIMATELY LEAD TO THE RISE OF THE ISLAMIC REPUBLIC OF IRAN!!! IRAQ was sanctioned for False reasons as well before the Gulf War II. During the sanctions Iraq was selling its Oil to the UN in Euro’s in the Oil for Food program.If the reasons for sanctions could be internationally proven false ,then oil is on the market being sold in Euros instead of dollars. Coincidently today both Iran and Venezuala sell oil for non-dollar prices. The Arab Socialist Ba’ath Party (also spelled Ba’th or Baath which means “resurrection or renaissance”; Arabic: حزب البعث العربي الاشتراكي‎) is a political party in the Arab World advocating the related concepts of Arab nationalism, Pan-Arabism, and Arab socialism. YUGOSLAVIA was a Secular Socialist country as well before the war. YUGOSLAVIA was found innocent ,NATO committed an ACT of War and a War crimes that included organ harvesting!! Slobodan Milošević (sometimes transliterated as Miloshevich; Serbian pronunciation: [sloˈbodan miˈloʃevitɕ] ( listen); Serbian Cyrillic: Слободан Милошевић; 20 August 1941 – 11 March 2006) was President of Serbia and of Yugoslavia. He served as the President of Socialist Republic of Serbia and Federal Serbia from 1989 until 1997 in three terms and as President of the Federal Republic of Yugoslavia from 1997 to 2000. He also led the Socialist Party of Serbia from its foundation in 1990. WHAT ABOUT A SMALL PRE-WAR IN AFRICA ,LIKE SOMALIA OR NIGERIA. AFRICOM has been situated in Stuttgard since 2007 ,……something must be holding things up.. In recent times, wars in the Middle East such as the Gulf War and the invasion of Iraq have been described as wars for oil. In many cases, critics have accused the U.S. of engaging in realpolitik in the cynical sense of political action without regard for principle or morals. A war planned for economic gain can be seen as a conspiracy in the conventional sense of a secret plot — particularly when the public is presented with false pretexts for war. It has been suggested that war is a perfect way of distracting citizens, as an electoral tactic, from difficulties facing the current administration. This premise is the basis of the film Wag the Dog, and the George Orwell novel 1984. Some have claimed that this was the motivation behind the Falklands War. At that time the National Reorganization Process, the right-wing dictatorship that ruled Argentina between 1976 and 1983, was facing increasing discontent among the population and this may have contributed to the decision to invade the Falkland Islands. Economic muppet and saviour of the banking universe Flash Gordon Brown,is dreaming of Maggie Thatcher again. Hey the Falklands worked well for Maggie , why not try it again? The Falklands Conflict- WAR ,WHAT IS IT GOOD FOR………. Well if you are a polition , its good for getting public support , distracting the public from your corruption and incompitence , it will increase thier stock portfolio and it will produce many juicey non-bid contracts to be awarded to the lobby group with the fattest envelope , ….and lots of cool photo oportunities ,when you can pretend to be brave while never actually putting yourself in physical risk. This does worry me ,as Flash Gordon Brown , saviour of the financial universe, …and economic muppet. He does like his Maggie Thatcher, and we all know (those of us old enough to remember) that in 1980 she was the most unpopular PM in history,UNTIL….the Falklands “Conflict”, but I think we can call it a war today, and then on a wave of Rule Britiania Maggie’s monetorists are put in power in a landslide. The conflict was the result of a protracted diplomatic confrontation regarding the sovereignty of the islands. Neither state officially declared war and the fighting was largely limited to the territories under dispute and the South Atlantic. The initial invasion was characterised by Argentina as the re-occupation of its own territory, and by the UK as an invasion of a British dependent territory. Coincidently BOTH countries where being run by very unpopular right wing regimes with serious economic troubles. War in this case was a good distraction from the economic woes and got the populations behind the unpopular governments. Maggie Thatcher was swept to power on the wave of Falklands victory,previously she was the most unpopular PM on record. Argentina is to make its case for sovereignty over the Falkland Islands to other Latin American countries, as tensions over potential oil reserves in the South Atlantic grow. The country’s foreign minister, Jorge Taiana, will ask other countries in a meeting of the Rio Group in Mexico to back his government’s claim to control the waters to “Las Islas Malvinas”.The row over the disputed islands has reignited after the discovery of £60bn-worth of gas and oil reserves off the Falklands. In London, Gordon Brown insisted international law allows British firms to operate freely in the area. Argentina has said their operations violate its sovereignty and announced this week that boats sailing from its ports to the islands would need a permit. Argentina has threatened to stop an oil rig, the Ocean Guardian, which is due to start work in the waters of the Falklands Economic Zone. The UK has warned it will be on international waters and any Argentinian interference would be in breach of international law. He looks like hes going to loose the next election,and with the economy in the state it is, a war is a good distraction from government corruption and incompitance and good for public moral, OH and they have discovered OIL …so what has he got too loose….the Oil Lobby will definately be pushing this one. The specific conflict between Georgia and South Ossetia and Abkhazia has its roots in the following. First, the Southern Ossetes , who until 1990 formed an autonomous region of the Georgian Soviet republic, seek to unite in one state with their co-ethnics in North Ossetia , an autonomous republic of the Russian Soviet republic and now the Russian Federation . There is an historically grounded Ossete fear of violent Georgian nationalism and the experience of Georgian hatred of ethnic minorities under then Georgian leader Zviad Gamsakhurdia, which the Ossetes see again under Georgian President, Mikhel Saakashvili. Saakashvili was brought to power with US financing and US covert regime change activities in December 2003 in what was called the Rose Revolution. Now the thorns of that rose are causing blood to spill. The notorious tie eating President is cooking up something nasty…….. IN ALL THESE WARS ,THE PEOPLE NEVER WANTED TO GO TO WAR ,THEY HAD TO BE PRESAUDED BY GOVERNMENTS LIES AND DECIEPTIONS. IT IS HUMANITY’S CONFORMITY THAT WILL KILL US! !